Bus from KL to Kulai is the most popular transportation option among the commuters. Many buses do not provide bus service to Kulai with the exception of Transnasional. Kulai is a small town adjacent to Malaysia second largest city Johor Bahru. Therefore many buses runs from KL and Johor Bahru without stopping at Kulai. In the market, Transnasional and City Holidays Express are the only bus operators serving bus from KL to Kulai. Transnasional is local favourite brand because of their consistent service and punctuality. City Holidays Express is dominant player in this route by providing frequent bus schedules to Kulai. The bus fare for bus from KL to Kulai is at around RM 34.30. The journey duration required for bus from KL to Kulai is close to 4 hours depending on traffic condition. 1 Washroom break will be provided during the journey. After opening of TBS (Terminal Bersepadu Selatan) on 1st Jan 2011, it has taken over the southbound longdistance express bus operation from Pudu Sentral. Hence, southbound bus service from KL to Kulai is departing from TBS. TBS is the first bus terminal in Malaysia operating with centralised ticketing system which targets to remove traditional touting services in bus terminal. The nearest LRT station to TBS is Bandar Tasik Selatan Station of the Ampang LRT line. The arrival point in Kulai is at Kulai bus terminal which is a relatively small bus terminal. 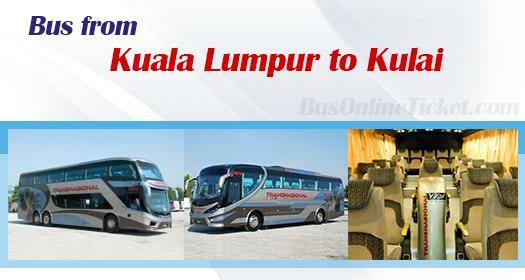 With the limited supply of bus service from KL to Kulai, commuters are advised to booking online in advance at BusOnlineTicket.com to avoid disappointment. Your booking in BusOnlineTicket is instantly confirmed upon payment. The online booking process is user-friendly, convenient, hassle-free and reliable.